More than 100 supporters of United Front of Democracy against Dictatorship (UDD) handed letters to the Burma and Singapore embassies in Bangkok on Friday, asking their governments to skip the 14th Asean Summit to be held in Hua Hin late February. The move by the United Front of Democracy against Dictatorship (UDD) was led by former prime minister's office minister Jakrapob Penkair. According to the letters, the government under the lead of Prime Minister Abhisit Vejjajiva "does not democratically represent the people of Thailand." Mr Jakrapob said that the government comes into existence only because of the heavy manoeuvering of "undemocratic external forces." "At the outlook, his coalition resembles the one with legitimate majority and seems politically qualified, but the very concept of such government can't be remotely considered democratic," he told reporters. Mr Jakrapob also criticised Foreign Minister Kasit Piromya, who is linked to the People's Alliance for Democracy. The red-shirt group plans to visit seven embassies of Asean countries next week to hand over the letters asking their governments to shun the summit. 9. Cambodia: Hun Sen loss in general election in 1996 to Norodom Ranariddh, so he went on all the way with revolution, and now he controls everything including press and etc. Also for the recent election, there were some fraud evidence for against the government for disqualify some voters, or incomplete list of people who is eligible to vote. UDD Protesters; Is it Wrong? So look at the open letter UDD, and I think I want to laugh at it! I think it is totally wrong move by the leader, and the protester to include such phrase within it, as well as the poster that they brought in front those embassies. It's just a thought from small people like me. 104 Soi 40 Phatthanakarn Rd. Your great nation is a vital ingredient to the ASEAN framework, and the current chairmanship of Thailand depends on it. 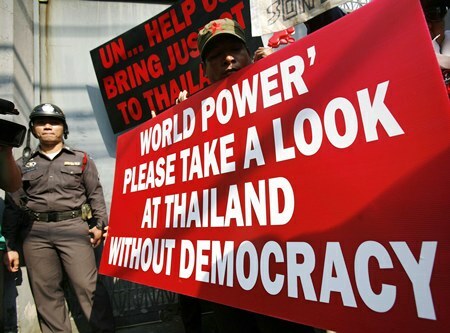 We thus appreciate your taking time to realize a political reality of Thailand today: the Thai government, the so-called Royal Thai Government led by Mr. Abhisit Vejjajiva, does not democratically represent the great people of Thailand. At the outlook, his coalition resembles the one with legitimate majority and seems politically qualified, but the very conception of such government can’t be remotely considered democratic. A democratically-elected government, as you are well-aware, must be led by the party with majority, which in turn reflects the will of the people. 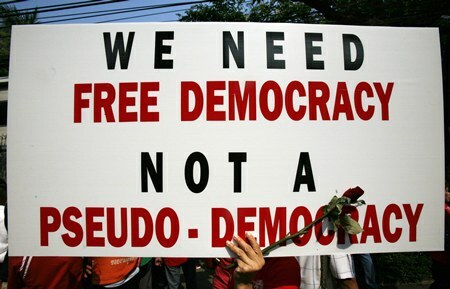 “The Abhisit government” came into existence only because of the heavy maneuvering of undemocratic external forces, the ones that disregard the true will of the people and their rights for self-determination. Furthermore, the appointment of Kasit Piromya asForeign Minister is an unbelievable act of recognizing a personality Thai people view as a terrorist, as he was a constant contributor to the seizure of both international airports of Thailand quite recently. In the eyes of most Thais, this government is politically handicapped. Such state of leadership should not be allowed to tamper with ASEAN’s good works, especially as its Chair. Therefore, we would like to officially address the problem to you, the respectable ASEAN partner, that the current Thai government is not well-regarded and not generally accepted by the people of the land. What to do and what gesture to be made are entirely up to you. Our civil duty is to inform you most directly of the will of the democratizing Thai citizens. We will continue to support the ASEAN framework. But we found it impossible to let a group of ill-conceived political appointees to represent us in there. We the Thai people have full trust in your judgment. Thank you dearly for your kind attention.